We often talk about scope differences between var, let and const. But even more often I still see learners struggling with fully grasping the idea of how it all works. I think it’s probably because concepts are rarely visualized. Let’s literally — take a look. Not all scopes are made alike. Let’s start with the block scope – the most basic of them all. All variables defined in Global Scope become available in all block scopes and can be used there. Variables defined with var inside a block scope are “hoisted” back into the global scope… but the actual value is not hoisted only its definition. When that happens the value becomes undefined. Global variables will propagate into the function scope but variables defined inside a function won’t hoist, even if they are defined using var. The idea is to protect variables from global scope but still be able to call the function from it. We’ll take a look at this in greater detail in just a moment. Protecting variables from outside scope helps reduce bugs in the long run. You may not see it right away. But if you stick with this idea, you will avoid causing bugs in the future that don’t really have to happen. With so many “differences between var, let and const” tutorial headlines it is easy to believe that the 3 are completely different. But this isn’t always true. Variables defined using let and const are not hoisted. Only var is. defined regardless of which keyword was used. Part of the function closure pattern is a function trapped inside another function. In the next example the inner function returns the counter variable. defined in an outer function. But because add() is a function it never leaks into global scope. You can think of it as a closure container. The trick? The counter variable is hidden from global scope. But we can still call add() from global scope. In other words counter variable remains private… but… we can access it from global scope as closure’s return value. The plus() function is defined by an anonymous function that executes itself. Inside the scope of plus, another anonymous function is created. It increments a private variable counter and returns the result back to global scope. The whole point is that Global Scope does not need to know or understand how the code inside add() works. It only cares about receiving the result of add() operation so it can pass it to other functions, etc. Closures are no longer as popular as they used to be. They were invented in the pre-ES6 era. Their functionality will be replaced in the future when private variables are added to the definitions made with class keyword. So why did we even bother explaining them? This is also sometimes called encapsulation — one of the key principles of Object Oriented Programming where inner workings of a class member method are hidden from the environment from which they were called. This is similar to why let was added to the language. It provides automatic privacy for variables defined within the confines of block-level scope. Variable privacy is a feature you will encounter in many programming languages. The let and const keywords conceal variable visibility to the scope in which they were defined and its inner scopes. Scope visibility differences surface when you start defining variables inside local block-level scope or function-level scope. As we have seen earlier in global scope there is no difference. Here are the proper places for defining local variables and properties. The this keyword is used to define object properties. Once defined in constructor they become available for access in all class methods via the this keyword (a reference to an instance of that object). remain limited to the scope of the constructor or the method in which they were defined, without actually becoming properties of the object. 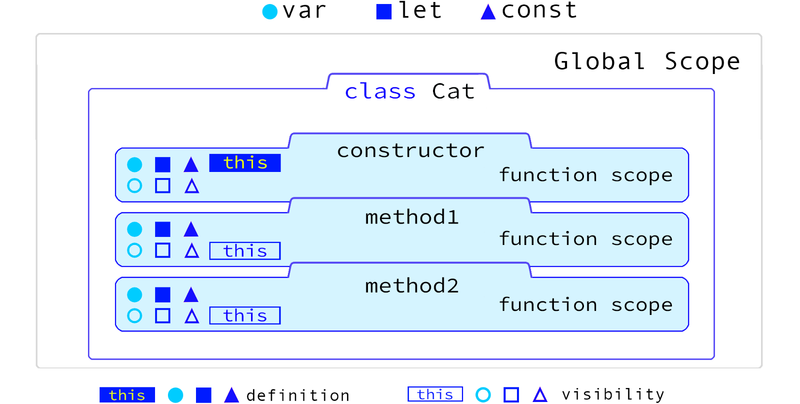 The constructor and methods are still technically just function scopes. 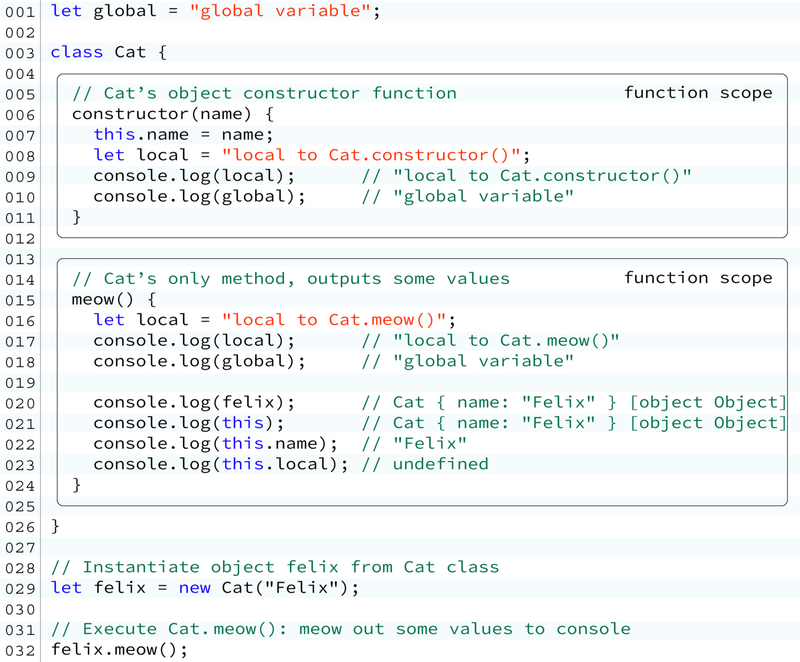 Dissecting a class: constructor and a method meow(). There is only one constructor that creates the instance of the object. But you can have as many methods as you want. Think of methods as actions your class can do. For a cat it could be: meow(), eat(), drink(), sleep(). Which actions should your class have? It depends on the purpose and type of the object your class defines. It’s an abstract model. You are the designer of your class. Go crazy. But why use felix inside meow() class when we can simply use this keyword to refer to the same thing? It was just an example. The const keyword is distinct from let and var. It’s still possible to change values of a more complex data structure such as Array or objects, even if variable was defined using const. Let’s take a look! When it comes to object literals, the const only makes the definition constant.